Our two-hour ferry journey on Saturday morning was late leaving Waitemata Harbour, but was otherwise calm. Cruising into port we passed several of the 30 mussel farms that span the Coromandel Peninsula’s west coast. We spent the rest of the day eating local mussels and browsing the boutiques along Wharf Road. On Sunday we went to Driving Creek Railway & Pottery to witness first-hand how one man turned his passion into a business venture. During the 1-hour tram ride we were treated to panoramic views of the neighboring islands and artwork by a variety of Kiwi artists. Next, we had a rare opportunity to visit a grove of mature kauri trees. The New Zealand kauri is endangered since it was over logged and there is currently a microorganism that feeds on its roots, stealing its nutrients. 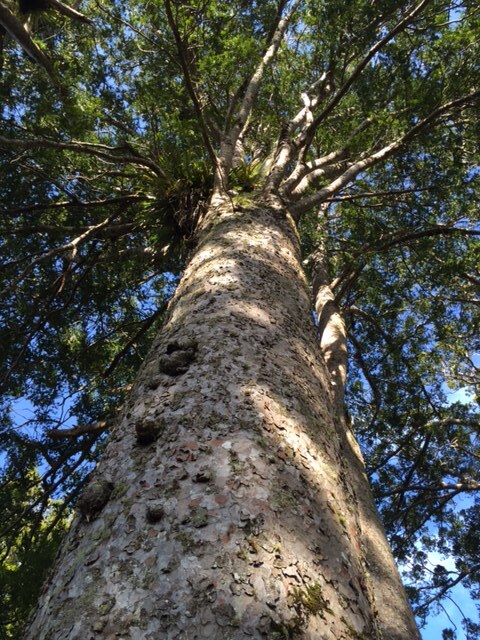 Kauri grow slowly – a 4-year-old tree is 3-4 inches high! For all these reasons it is rare to see several kauri trees together, but this forest includes a grove of six that are 100+ years-old. They are magnificent! Seeing them makes you want to care for them, including following the tedious shoe cleansing process upon entering and exiting the forest to prevent kauri dieback disease. After a quick stop to pick up smoked mussels to bring home we returned to the ferry. Coromandel in the winter is a sleepy town. It clearly thrives during warmer weather since many of the restaurants do not have indoor seating. We had a nice time, but in hindsight we would have been happy doing this as a day trip from Auckland. Accommodation: Tidewater Tourist Park Motel was a YHA when I booked it but the partnership split prior to our stay. The place was empty so although we booked a room with bunk beds the host moved us to a double room at no charge. The room smelled faintly of cat urine. I did not see the cats outside until the next day. It had a nice outside area if you want to bbq. Restrooms are what you’d expect at a campground. liturgy and distribution of communion at St Coleman church. This parish is one of 4-5 supported by one priest; he was not able to make it there for mass this weekend. the Coromandel Smoking Co (all sorts of smoked mussels and fish) so good!